BROWSE HOMES FOR SALE | FEATURED LISTINGS | CONTACT ME | WHAT IS YOUR HOME WORTH? Mari's mission: To develop quality working relationships with her clientele; relationships based on respect, integrity, and trust. Mari Bertog, Berkshire Hathaway Home Services KoenigRubloff Realty Group Broker associate, has proven sales, marketing and negotiating skills in Real Estate. 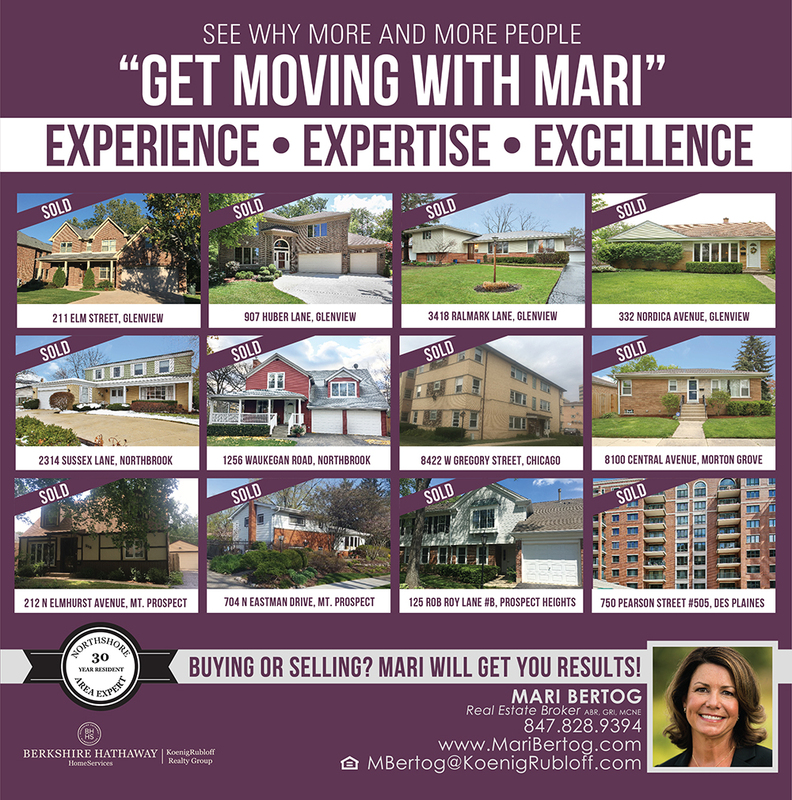 Mari enjoys helping real estate needs in the following areas: Glenview, Northbrook, Morton Grove, Deerfield, Highland Park, Wilmette, Winnetka, Arlington Heights, Buffalo Grove, Des Plaines, Skokie, Niles, Evanston, Prospect Heights, Mount Prospect and the greater North Shore Chicago area. Mari prides herself on her Experience, Expertise and commitment to Excellence. Mari has developed beneficial relationships to provide the many resources needed to sell your home: Staging, Professional Photography, Floor Plans, Attorneys, Contractors, Inspectors and Lenders. She enjoys working with all of the different demographics and age groups in the markets to buy or sell a home. Whether it be the Millennials, the Baby Boomers or the Silent Generation; It doesn't matter if they are first time buyers, upsizing/downsizing or selling their long time family home, Mari’s clients love the way she is easy to reach and how she communicates every step of the transaction. As a buyer or a seller you will know that you have a patient and knowledgeable professional always working for you. Mari will work in any area of the North Shore. She has been a resident in the North Shore for 30 years. She and her husband have raised four children and have enjoyed all of the great amenities of Glenview and the surrounding suburbs. Convenience of easy accessibility to parks, schools, shopping centers, Amtrak hub and Metra trains, and proximity to O'Hare make the North Shore Suburbs very desirable to live in!! Aside from Mari's busy life in real estate she enjoys being active and giving back to her community as demonstrated through her participation in the Koenig Rubloff Foundation (helping Habitat for Humanity and The Sunshine Kids). When she has free time she enjoys an occasional game of tennis, golf or bridge! She is happy to talk to potential buyers about life in Glenview and on the North Shore and why she has chosen this community!! Getting results in 2017! I can help buy and sell your home!